Welcome to the International Human Rights Law Video Library (IHRLVL). Your host, Professor Jean Allain, introduces the video library. The Library has video holdings of interviews with leading commentators and practitioners in the field of international human rights. Further, the Library has video clips of visits to various sites which provide insights into the manner in which international human rights law functions.The IHRLVL is one of the resources of the Castan Centre for Human Rights Law. In an interview with Professor Jean Allain, Professor Christine Chinkin explains why feminist theories became prominent in the post-Cold War period marked by UN’s increased focus on women’s rights. In an interview with Professor Jean Allain, Professor Christine Chinkin explains the feminism as it relates to human rights, particularly the Convention on the Elimination of All forms of Discrimination Against Women (CEDAW). In an interview with Professor Jean Allain, Professor Christine Chinkin speaks about her interest in international law. In 2003 Professor Jean Allain had an interview with Ambassador Ibrahim Badawi, the then president of the African Commission on Human and Peoples’ Rights (ACHPR) who spoke about his career and how he became president of the ACHPR. In an interview with Professor Jean Allain held in 2003, Ambassador Ibrahim Badawi, the then president of the African Commission on Human and Peoples’ Rights (ACHPR) spoke about his fondest memory as a president of the ACHPR. In an interview with Professor Jean Allain held in 2003, Ambassador Ibrahim Badawi, the then president of the African Commission on Human and Peoples’ Rights (ACHPR) explains the role of the ACHPR. In an interview with Professor Jean Allain, Professor David Weissbrodt, Professor of Law at the University of Minnesota and founder of the University of Minnesota Human Rights Library, introduces himself and his affiliation. 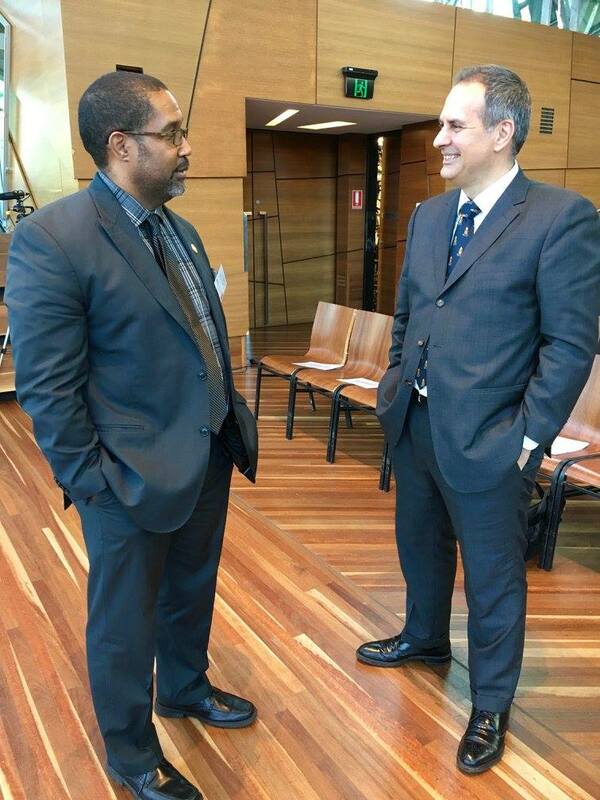 In an interview with Professor Jean Allain, Professor David Weissbrodt, Professor of Law at the University of Minnesota and founder of the University of Minnesota Human Rights Library, speaks about his work within the UN. In an interview with Professor Jean Allain, Professor David Weissbrodt, Professor of Law at the University of Minnesota and founder of the University of Minnesota Human Rights Library, explains the treaty based and charter based systems for human rights protection at the international level. In an interview with Professor Jean Allain, Professor David Weissbrodt, Professor of Law at the University of Minnesota and founder of the University of Minnesota Human Rights Library, speaks about the role of the sub commission of the commission of human rights. Peter Hulsroj, Legal Advisor to the Preparatory Commission for the Comprehensive Nuclear-Test-Ban Treaty Organisations (CTBTO) speaks about his Organisation and his role as the legal advisor in an organisation dedicated to non-proliferation. Judge Thomas Buergenthal of the International Court of Justice considers the International Court of Justice, its jurisdiction and the collegiality within the Court; the manner in which the judgements of the Court may be enforced. He also speaks about reservations to treaties and considers the doctine of stari decisis. The Legal Counsel of the World Heatlh Organisation, Gian Luca Burci, considers the WHO and its relationship to international law. He considers the role of the WHO's Assembly with regard to law-creation, reservations, the move within the WHO to establish an Anti-tobacco treaty and how it emerged. Judge Navanethem Pillay, President of the International Criminal for Rwanda Tribunal (1999 - 2003 ) and later Judge of the International Criminal Court introduced herself and explains why the Rwanda Tribunal was established. Judge Pillay speaks about the legacy which the ICTR will leave in respect to the evolution of international jurisprudence, and discusses the means by which the ICTR will finish its work. Judge Pillay (elected in 2003) speaks of the history of the ICC, its jurisdiction and her role as an Appellant Judge, and the process of being elected a judge of the ICC. Judge Pillay was then asked to consider what the largest challenge is to the success of the International Criminal Court. In an interview with Professor Jean Allain, Professor Georges ABI-Saab speaks about his career in international law and explain dispute settlement within the World Trade Organization (WTO) and the relationship between the WTO and international law. In an interview with Professor Jean Allain, Professor Georges ABI-Saab explains dispute settlement within the World Trade Organization (WTO) and the relationship between the WTO and international law. Professor Jean Allain speaks about the attributes of the state on site at north of the divided city of Nicosia in the so called Turkish Republic of Cypress. Professor Jean Allain was on site at Apollonia, which was the last slave fort by Europeans on the Gold Coast built by the British in 1765. Professor Jean Allain was on site at Axim slave fort at the Gold Coast. Professor Jean Allain was on site at Fort Amsterdam- Ghana. Professor Jean Allain visited Fort St James Slave Trade Warehouse.